Home \ Featured \ A Mammoth Celebration! Free stuff just for Dropping by! Celebrating their Year of the Mammoth Event and Leading up to the Official release of Journey to Un’Goro in Hearthstone. This is the second of them, the first being a Brawl where winning a Match in Hearthstone scored you a free Un’goro Pack, but this one comes with even more rewards. Along with another Brawl Event starting on March 29th, starting from that date for the next week just logging in will net you some decent to great rewards for no trouble at all. The Rewards Per day are as follows. 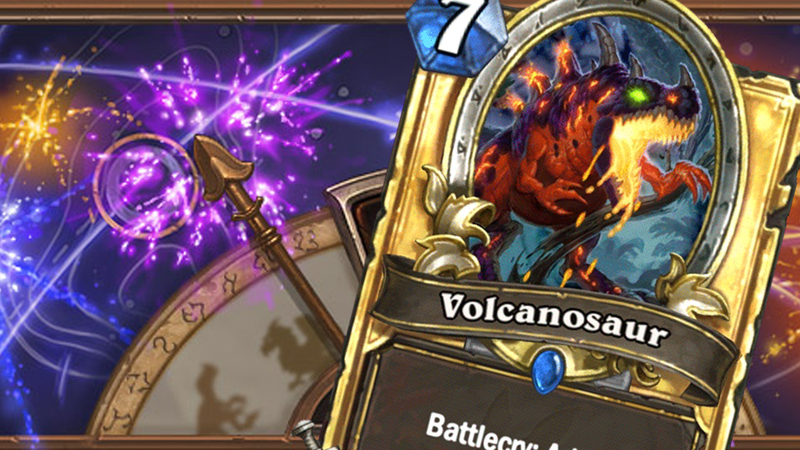 At the end of it all on April 5th though You can also earn earn the Rare Volcanosaur card, pictured above. This card will be a pretty decent addition to quite a few Deck builds, sporting a slightly low 5 Power and 6 Toughness for 6 Mana, but with the Battlecry: Adapt, then Adapt, allowing it to gain 2 Adapt effects whenever you play it giving you a random, albeit powerful drop that could potentially be a game winner. The Log in Rewards are on the same time frame as the daily Quest resets if your wondering, so if yo know your local times you can get them out in pretty short work, and even then its just a few short clicks to get in and get your Year of the Mammoth Rewards!